Luke Easton, a PhD student from our laboratory studying Conservation Palaeontology, is about to drop into Martinborough’s Cave of Bones. Abseiling into the tomo he is assaulted by the putrid rich smell and sight of rotting sheep carcases that lie between him and his treasure. You see, Luke is on the hunt for the bones of some of the smallest members of New Zealand’s lost biodiversity club: Leiopelma frogs, one of our taonga that few New Zealander’s will be lucky enough to see. Once through the sheep carcass soup and a tight squeeze, laid out before him along the cave passage were the remains of moa, kakapo, kiwi, takahe, tuatara and the tiniest of frogs. Luke Easton enjoys a moment of contemplation down Martinborough’s Cave of Bones next to the daily special of sheep soup (foreground). Photo by Ana Dula. Leiopelma frogs have a deep biological heritage in New Zealand since the time Zealandia started to split from eastern Gondawana around 80 million years ago. In fact, the closet living relative of Leiopelma is the enigmatic North American tailed frog Ascaphus. 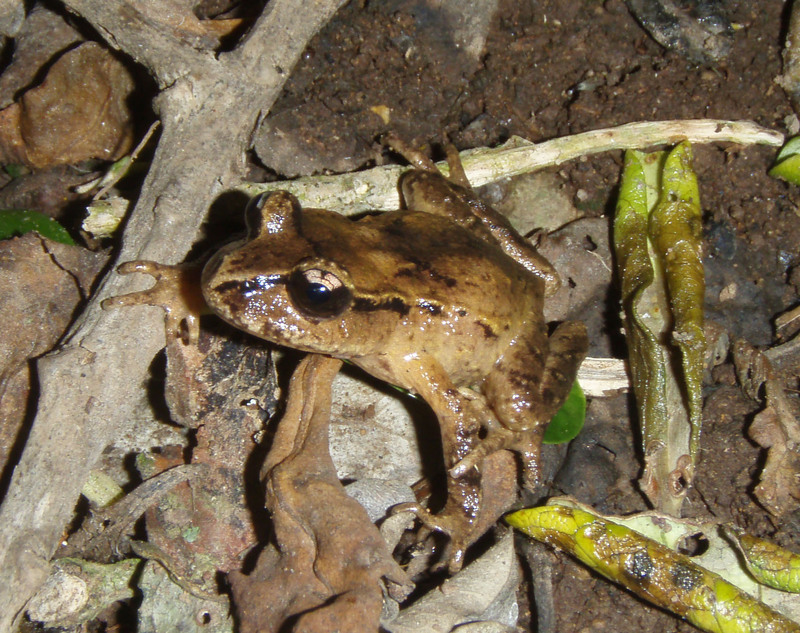 In today’s world, there are only four species of Leiopelma frog, all of which are threatened with extinction: Archey’s Frog (L. archeyi), currently restricted to two locations in the Coromandel and Waitomo; Hochstetter’s Frog (L. hochstetteri) comprising numerous fragmented populations in the northern North Island; Hamilton’s Frog (L. hamiltoni) on Stephens Island, off the northern tip of the South Island; and the Maud Island Frog (L. pakeka), restricted to a single island in the Marlborough Sounds. There has been heated debate surrounding the taxonomic status of Leiopelma frogs, especially in a fiscally constrained world where species conservation needs to be prioritised and hard decisions made. Determining species boundaries based on modern geographic distributions and contemporary data is fraught with danger. Palaeontology and ancient DNA, as we know, has the power to re-write our understanding of our precious biodiversity. Discovered over one hundred years ago by a local hunter, Martinborough’s Cave of Bones has shed light on what the lower North Island may have looked like a thousand years ago with tonnes of bones excavated by Te Papa scientists and its forerunner the Dominion Museum. It’s fossil localities like the Cave of Bones, and others around New Zealand, that hint at a much more complex biological heritage of Leiopelma frogs. Fossil remains of Leiopelma are found throughout the North Island, the northwestern and western South Island, and southern New Zealand, and include several recently extinct species: Waitomo Frog (L. waitomoensis), Markham’s Frog (L. markhami), Aurora Frog (L. auroraensis ), and potentially a few undescribed new frogs. 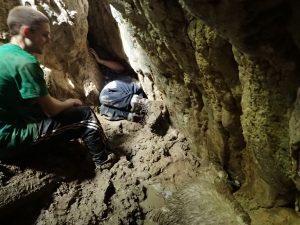 A tight squeeze through the cave passage (left) reveals Martinborough’s Cave of Bones (right). An extinct North Island Adzebill skull can be seen in the background. Photos by Clint and Luke Easton. As part of a wider study into using palaeontology and ancient DNA to inform conservation management decisions we embarked on a research programme to characterise the morphometrics (i.e. shape) and osteology (i.e. bumps on bones) of Leiopelma fossils. Characterising the shape of large bird bones is one thing. Doing the same thing on small frog bones that can easily break apart in your hands is an entirely different matter that involved new approaches including state-of-the-art digital geometric analyses and CT scans of boiled down frog skeletons. What followed was months spent in the basement of museums, amongst the ghostly skeletal remains of our lost biodiversity, characterising the shape of thousands of fossil frog bones. What resulted was a complete surprise and is beginning to revolutionise what we know about New Zealand’s endemic frogs. This study has just been published in the Zoological Journal of the Linnean Society and involved collaborators from the University of Otago, Victoria University of Wellington, Museum of New Zealand Te Papa Tongarewa, Canterbury Museum, and Flinders University. Months were spent in musuem basements, next to the ghostly skeletal remains of our lost biodiversity, measuring fossil Leiopelma frog bones. Photos by Luke Easton. Probably the most startling discovery, and the one with the biggest conservation management implications, is that Archey’s, Hamilton’s and Maud Island Frogs are probably the same species, not three separate species as currently known. There is no morphological difference between these three frogs, supported by a lack of genetic divergence between these species, based off modern DNA. Ongoing ancient DNA research is currently underway to see if this pattern holds but it’s already clear that the distribution was much wider prior to Polynesian arrival in New Zealand, opening up the possibility of translocations and genetic rescue of inbred populations. In the meantime, we may need to think about a new common name for this frog to avoid confusion. Will the real frog please stand up….Morphological and modern genetic evidence suggest that Archey’s (left), Hamilton’s (middle) and Maud Island (right) Frogs are the same species. Photos by Luke Easton, Phil Bishop and Steve Reilly. But what could possibly have caused this contemporary disjunct distribution? It’s likely that ancestral frogs were widespread around the North Island and northern South Island during the height of the last Ice Age. Rising sea levels due to melting polar ice caps isolated some frog populations on Stephens and Maud Islands, with the latter arrival of Polynesians causing the extinction of intervening populations, resulting in the distribution we know today. Further ancient DNA research will also settle the debate over whether isolated Hochstetter’s Frog populations are different subspecies or management units. As well as informing species conservation, the impact of Polynesians may have been far greater than ever thought. The morphological analysis showed that the extinct Markham’s Frog (L. markhami) may represent numerous cryptic taxa, rather than one widespread taxon, as a result of glacier driven evolution (i.e. glacial ice during the height of the last Ice Age promoting the evolution of biodiversity through isolation in glacial refugia…think of the characters in the movie Ice Age migrating south to escape the oncoming long winter). Ancient DNA will no doubt shed light on this interesting pattern. Luke Easton’s paper ‘Testing species limits of New Zealand’s leiopelmatid frogs through morphometric analyses’ has just been awarded the Department of Zoology Fairlea Prize for the best paper by a male postgraduate student. A truly stunning write up. Congrats!!! I excavated and identified the three extinct Leiopelmatid morphs that 16 years later were named as Leiopelma waitomoensis, L markhami and L auroraensis by Trevor Worthy. I have followed the DNA-based palaeontological research in more recent years with much interest. I retained both assemblage and taphonomic data and interpretations from that work that I do not see reflected on later investigations and hypotheses concerning extinctions and ecological changes. My research paradigm-level observation is that many palaeo-workers in subfossil assemblages and genetic studies, are good at using technological methods but not so proficient at a robust palaeo-ecological assessment that integrates natural and archaeological deposit and the genetic evidence. To the authors of this paper in the Zoological Journal of the Linnaean Society: this commentary is by way of seeking from any of you a digital copy of your published paper as I have no current access to it.